Hull-based Smales, one of the UK's leading suppliers of fish and seafood, now has an almost zeroenergy, cost-saving, waste ice melting process. In this, the green-coloured Dolav Ace plays a vital role. 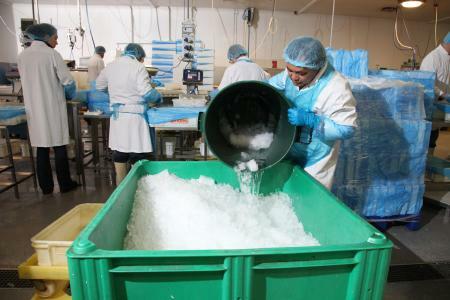 Fresh fish arrives from suppliers packed with ice and during processing has ice added. This causes Smales to dispose of waste ice every week. By removing ice from general waste, Smales has reduced the weight sent to landfill by two tonnes a week, saved money and found other benefits. 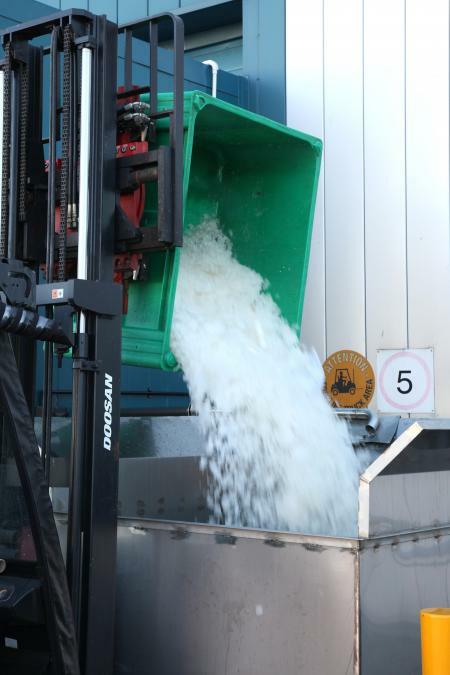 Ice being emptied into metal stillage for recycling. In a surprising simple system devised by the consultant engineer at Smales, waste ice is forklift tipped from green Dolav Ace plastic pallet boxes into a stainless-steel container in the yard. 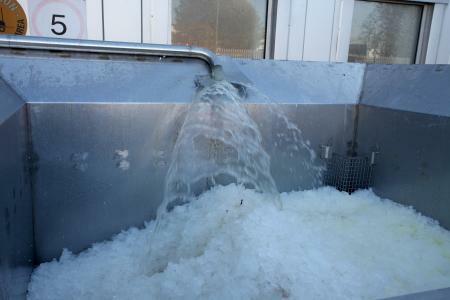 Factory waste water at 10-12 degrees Celsius sprays the ice, melting it during the coldest winter periods. The melted ice water and waste water go to a sludge trap before entering the normal drainage system. It requires no extra heat, almost no energy or running cost and is a very carbon-friendly solution. Waste ice being melted for safe disposal. "We are pleased not to send two tonnes of waste water to landfill each week at just over £100 a tonne and we have halved our collection fees, saving us some £300 pounds every week," said Simon Paterson, technical manager at Smales which estimated a project pay back of four months. "The savings were greater than we expected and the pay back, including the cost of the new Dolavs, was about five weeks. We now reckon we will save £40-50,000 a year," said Simon Paterson. "The difference it has made is phenomenal - more than we were anticipating, more than cost saving. We no longer have pools of melt water around the waste compactor and waste skip, fewer waste vehicle movements, cleaner and dryer compacted waste handling," he added. In this very hygienic environment producing food for human consumption, the Dolavs are given a frequent sterilising chemical rinse and pressure washed clean before going back in to the fish processing areas. Campden BRI has confirmed the Dolav ace as having hygienic design, which adds to the confidence Smales has in the Dolav Ace. green project since May 2013," Patterson said.